Today is a slow day for me and Sam. Since Rob and I picked him up from my Mom's house, Sam has been sleeping a marvelous 12 hours a night and he is still taking 4 hours worth of naps a day. I know not what my mom did to make this happen, but my eternal gratitude is with her. Sam and I went for a swim today. He was all chill in his floatie. I expected him to do his crazy splash routine which causes him to inhale sharply from the water flying in his face, but he didn't. He just did his gangsta lean and chilled out. He even wore his hat the entire time. He pointed repeatedly at the table umbrellas and at some birds flying overhead. I gently splashed to spur him into action, but once he tried he frowned at the droplets on his face. He has apparently outgrown that phase. But fear not! A new phase has taken its place! Its the Rub-Food-All-Over-My-Face phase! Any boy is it fun! Nothing I could do could keep this baby clean during lunch today. 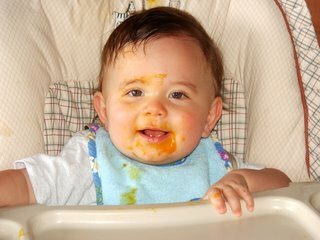 He seemed to love the carrot-apple-mango facial and even tried some in his hair. He seemed to love even more the sight of me walking up with the camera. He gave me a Cheshire Cat grin when he heard the camera power up. Baby being cute = Mom takes pictures. It's like he knew.